Third party, bi-level, liquid stable quality control material to monitor the precision of laboratory testing procedures for D-Dimer Assays. 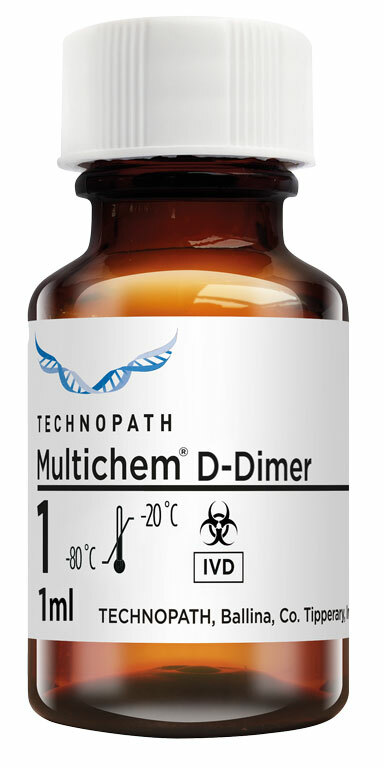 Multichem D-Dimer Control is intended for use as a third party, bi-level, liquid stable quality control material to monitor the precision of laboratory testing procedures for D-Dimer Assays. D-Dimer is a fibrin degradation product (FDP), a small protein fragment present in the blood after a blood clot is degraded by fibrinolysis. D-Dimer is so named because it contains two cross-linked D fragments of the fibrin protein. Since its introduction in the 1990s, it has become an important test performed in patients with suspected thrombotic disorders. While a negative result practically rules out thrombosis, a positive result can indicate thrombosis but does not rule out other potential causes. Its main use, therefore, is to exclude thromboembolic disease where the probability is low. Coagulation, the formation of a blood clot or thrombus, occurs when the proteins of the coagulation cascade are activated, either by contact with damaged blood vessel wall (intrinsic pathway) or by activation of factor VII by tissue activating factors. Both pathways lead to the generation of thrombin, an enzyme that turns the soluble blood protein fibrinogen into fibrin, which aggregates into proteofibrils. Another thrombin-generated enzyme, factor XIII, then crosslinks the fibrin proteofibrils at the D fragment site, leading to the formation of an insoluble gel which serves as a scaffold for blood clot formation. D-dimers are not normally present in human blood plasma, except when the coagulation system has been activated, for instance because of the presence of thrombosis or disseminated intravascular coagulation. The D-Dimer assay depends on the binding of a monoclonal antibody to a particular epitope on the D-dimer fragment. As D-Dimer is released into the circulation during the fibrinolytic process, the measurement of D-Dimer and higher molecular weight oligomers containing D-Dimer, epitopes is considered to reflect the overall activity of clot formation and lysis. Elevated levels of D-Dimer can occur in a variety of clinical conditions associated with fibrin breakdown, including Deep Vein Thrombosis (DVT), Pulmonary Embolism (PE) and Disseminated Intravascular Coagulation (DIC). D-Dimer is generally used for its negative predictive value. Multichem D-Dimer Control is designed as a bi-level, liquid stable frozen product. The product will typically be run to provide a minimum of two levels of control to monitor D-Dimer assay performance within the analytical ranges. Multichem D-Dimer Control will be run after reagent calibration and at a frequency dictated by laboratory QC procedures and reagent / instrument manufacturer instructions. The product should be treated the same as patient specimens and run in accordance with the instructions accompanying the instrument, kit or reagent being used. The Control is to be stored at -20°C to -80°C and thawed as per IFU prior to use. The product is to be stored at 2 to 8°C between use.